Ever since we moved into an apartment together and I insisted on buying the smallest fridge-freezer in the entire kitchen appliance store as some sort of bizarre money-saving measure, I’ve been regretting winning the argument. (I’m convinced there’s a future blog post just waiting to be written on the subject of the strange arguments he lets me win, even when he knows I’m wrong). Turns out, there’s no such thing as a fridge or freezer that’s too big. Not when you can stuff it with leftover bits of pastry, excess cookie dough and more than one flavour of ice-cream. Or perhaps it’s a mixed blessing that I had to evict an unbaked tart case from the freezer the other day, to make room for a bag of green chillies and a few wilting stalks of lemongrass. 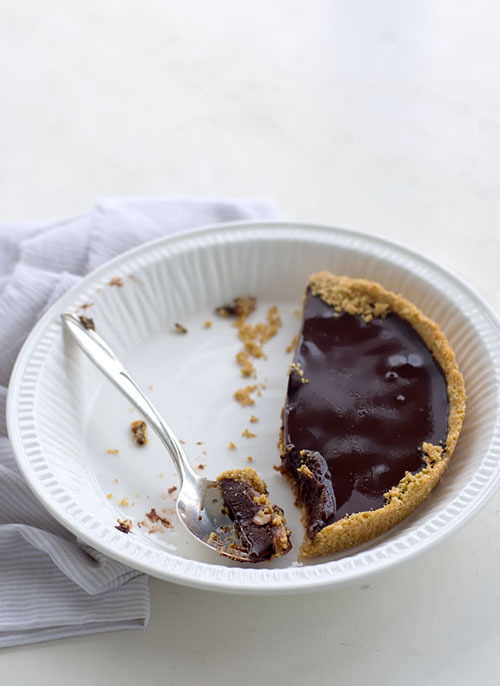 Our fast and easy dessert that evening was this tart, filled with a mixture of pantry ingredients. Speculoos is one of my favourite cookies that I put in almost anything I can get away with. If you don’t have any, try the same recipe with gingersnaps or chocolate cookies. 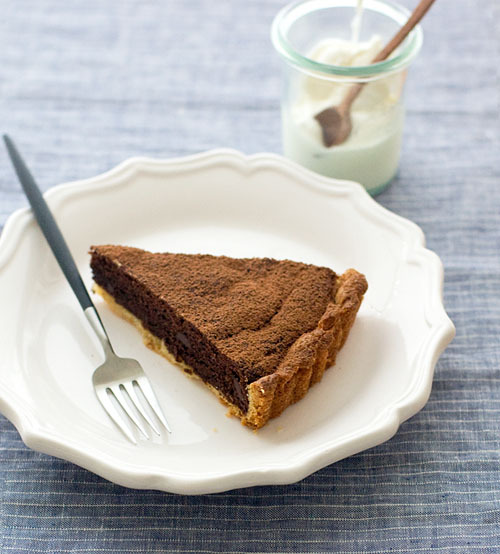 I’m thinking a Tim Tam version of this tart might have to be the next thing I tackle on my to-bake list. Now if only there was another spare tart case in the freezer that needed to be used..
Preheat the oven to 170’C. In a stand mixer, cream the butter and sugar until light and fluffy. Add the eggs one at a time, beating well. Fold in the speculoos crumbs, cocoa powder, cinnamon and salt, followed by the chocolate chips. Spread the mixture evenly on top of the shortcrust pastry. Bake for about 30 minutes until the pastry is golden. 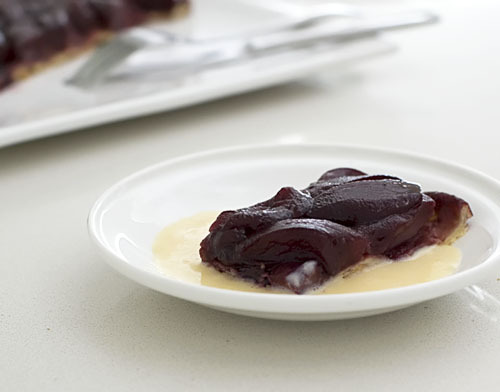 Allow to cool on a wire rack before removing the tart from the tin. Serve warm or at room temperature with cinnamon whipped cream, sweetened yogurt or vanilla ice-cream. Anyway, it’s rather fortunate that my brother married a truly lovely and wise lady, otherwise a few days ago you would have found me trying to balance a party hat on my head while attempting to carve macarons. Not a pretty sight. 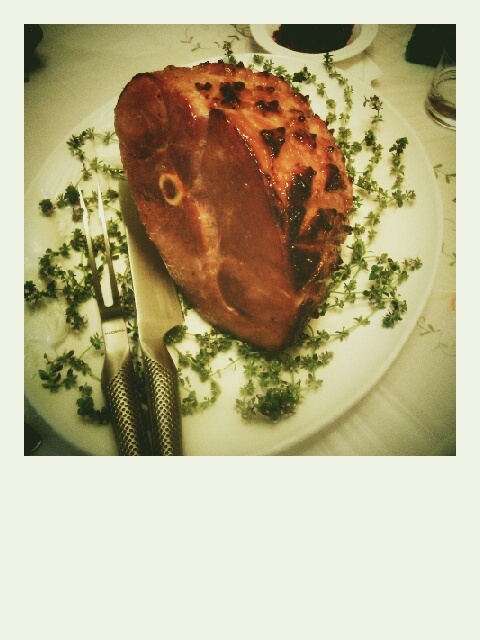 After much feasting, our post Christmas meals have featured more sensible portions of rehashed leftovers. Sandwiches, kimchi ham fried rice and turkey curry. I’m already dreaming of the day when I’m eating notHam and notTurkey for dinner. There were no dessert leftovers, so pie was made to keep us company. In a food processor, blitz the pretzels to a powder. Add the melted butter and pulse until well combined. Divide the mixture between two pie tins (I used foil pie tins). Press the mixture down and up the sides of the tin. It will seem a bit loose but persevere. The end result will be worth it. Chill the crust for 30 minutes then bake in a preheated 175’C oven for 12 minutes. Once baked, allow to cool down, then chill the pie crusts while you make the caramel filling. In a medium sized pot, combine the demerara sugar and corn syrup. Allow the sugar and corn syrup mixture to caramelise, stirring occasionally with a heatproof spatula. When it has reached a deep golden brown colour, remove the pot from the heat, add the salt and butter, followed by the cream, being careful not to scald yourself. Whisk until combined. Reheat the mixture gently over a low flame if the caramel hasn’t completely dissolved. Pour the finished caramel into a heatproof bowl to allow to cool down a little, before dividing it between the two pie crusts. At this point you can also sprinkle a handful of spiced peanuts over the caramel. 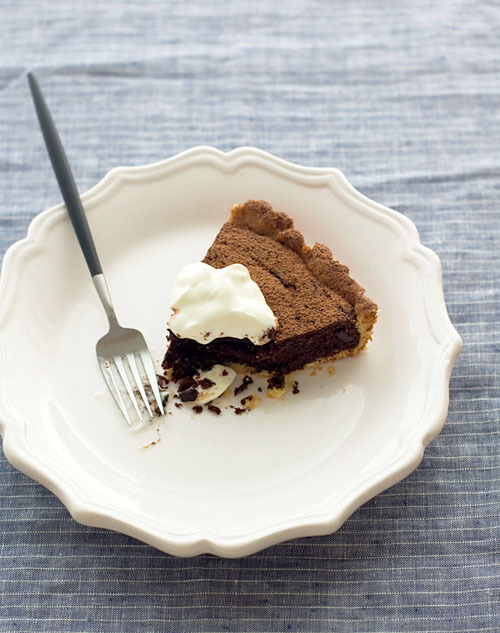 Chill the pies while you make the chocolate filling. Melt the chocolate and butter in a bowl over a pot of simmering water. Remove from the heat and set aside. Bring the water or beer to just below boiling point. Pour it over the chocolate-butter mixture. Let stand for 1 minute, then whisk to emulsify the chocolate. Divide the chocolate mixture between the two pies, then chill until just set. The pies are best served at room temperature but can also be served straight from the fridge. They take on a different, almost chewy texture when eaten chilled. 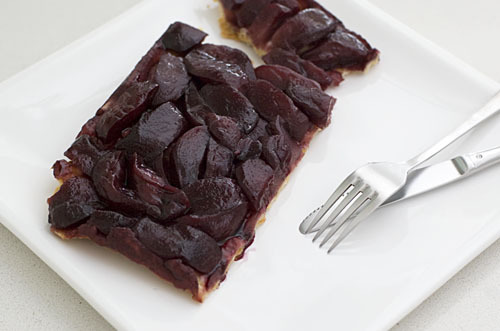 Yesterday I flipped through David Lebovitz’s Ready for Dessert and came across a recipe for Apple Red Wine Tart. That was the beginning of the end. In the beginning, I marched down to the shops for a bottle of red wine and a bag of apples. Somewhere in the middle, I burnt my red wine reduction and wished I could blame David for this. Actually I had been distracted by Twitter, but never mind, start again, because it’s only the middle of the end.